Here you’ll find key reports, guides, briefings, brochures and other documents published by FBC, or by FBC in partnership with other organizations. See also: Annual Highlights, Sustainability Snapshot reports and the Smart Planning for Communities and BC Regional Adaptation Collaborative programs for other resources. Download the report from the BC Ministry of Health website. Visit slippbc.com for more resources. Can’t find an FBC publication? 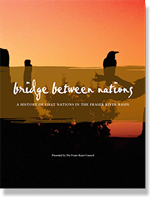 Updated and reprinted by FBC in 2013 — thanks to financial support from Simon Fraser University — Bridge Between Nations is available here in electronic form and in bulk print quantities for classroom and other educational use. Please contact the Communications Manager to enquire. Looking for a quick update on FBC? Read Sustainability Matters: Annual Highlights 2012-2013. This report offers a synopsis of key FBC programs and services and our work of the past year on climate change and air quality, healthy watersheds and water resources and sustainable, resilient regions and communities. Drinking water protection and economic diversification are top sustainability issues for rural community leaders, according to a new research report from Smart Planning for Communities in partnership with the Pacific Climate Impacts Consortium. 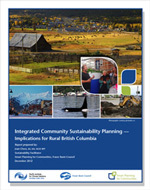 Integrated Community Sustainability Planning — Implications for Rural British Columbia looks at both municipal and regional perspectives on priority strategies and actions unique to rural BC. Download your copy.